To Haakon Hauan on the "Ships starting with H" page. Built by Akers Mekaniske Verksted A/S, Oslo in 1935. A forum posting by a relative(?) of Anfinn Hopland, who is said to have joined Haakon Hauan from Telnes in Jan.-1940. June 13 Halifax Liverpool June 28 HX 50 See also narrative below. July 15 Liverpool   OB 184 For Aruba. Nov. 2 Liverpool   OB 238 Dispersed Nov. 5. Dec. 6 Halifax Liverpool Dec. 23 HX 94 Missing voyages, Page 1. Jan. 24 Clyde   OB 277 For Aruba. *Page 1 gives arrival Febr. 20. Apr. 21 Milford Haven   OB 313 Dispersed Apr. 28. July 27 Halifax Milford Haven* Aug. 10 HX 141 *Belfast Lough. Aug. 30 Southampton Falmouth Sept. 1 PW 27 Via Dartmouth (see Page 2). Sept. 6 Milford Haven   ON 14 For NYC. Nov. 8 Loch Ewe   ON 34 For NYC. 1942 Jan. 5 Milford Haven   ON 54 For Baytown. May 17 Hampton Roads   KS 501 Detached May 23. June 25 New Orleans Mobile June 26 In tow To repair torpedo damage. Sept. 13 Pilottown Galveston Bar Sept. 15 KH 402 Pilottown to Galveston Bar. Oct. 18 Belfast Lough Belfast Lough Oct. 18 ON 140 Returned with weather damage. Nov. 2 Belfast Lough New York City Nov. 17 ON 143 Convoy will be added. Dec. 6 S W Passage Key West Dec. 9 HK 124 S W Passage to K West. Dec. 29 New York City Liverpool Jan. 14-1943 HX 221 See also narrative below. Febr. 18 New York City Barrow March 6 HX 227 Convoy will be added. March 13 Clyde   ON 173 For NYC. Joined XB 40 March 29. June 20 Gibraltar Baltimore July 11 GUS 8A From Gibraltar. Aug. 27 Clyde Belfast Lough Aug. 29 ON 199 Returned. Sept. 3 Belfast Lough New York City Sept. 18 ON 200 Convoy will be added. Nov. 24 Hampton Roads Gibraltar Dec. 11 UGS 25 For Gibraltar. Dec. 22 Gibraltar Oran Dec. 23 KMS 35 Convoy will be added. 1944 Jan. 6 Oran New York City Jan. 24 GUS 26 Oran to USA. Apr. 7 Liverpool New York City Apr. 24 ON 231 Convoy will be added. June 2 Hampton Roads Bizerta June 22 UGS 44 For Bizerta. Aug. 24 Clyde New York City Sept. 7 ON 250 Convoy will be added. Sept. 30 Key West   KN 341 Detached Oct. 5. Apr. 13 New York City Belfast Lough Apr. 28 HX 350 Convoy will be added. For information on voyages made in between those mentioned here, please see the documents received from the National Archives of Norway and A. Hague's Voyage Record above. Follow the convoy links provided for more details; the Commodore's narrative and/or notes are also available for some of them and several Norwegian ships took part. As will be seen when going to Page 1 of the archive documents, Haakon Hauan was on her way from Baton Rouge to Norway when the country was invaded by the Germans on Apr. 9-1940, but was diverted to Stanlow. She first headed to New York, where she spent over a month before proceeding to Halifax on May 25 - see Nortraship for information on the difficulties in those early days of the war. She was scheduled for Convoy HX 47 from Halifax on June 1, but did not sail (Italia was sunk - follow the link for details), and was also cancelled from HX 49 on June 9 (Eli Knudsen and Randsfjord were sunk), but eventually got away with HX 50 on June 13, and arrived Stanlow on the 29th. The following month, we find her, together with Balduin, Fana, Fenris and Polartank, in Convoy OB 184, which departed Liverpool on July 15 and dispersed on the 18th, Haakon Hauan arriving Aruba on Aug. 1. More info on this convoy is available via the external link provided within the above record. She was scheduled to return to the U.K. in Convoy HX 66 from Halifax on Aug. 16 (Norne was sunk), but joined Convoy HX 69 on Aug. 28, cargo of gas oil. She later shows up in Convoy OB 238, which left Liverpool on Nov. 2 and dispersed on the 5th. She was again bound for Aruba, where she arrived Nov. 21. On Dec. 3, she was scheduled for Convoy HX 93 from Halifax, but instead joined the next convoy on Dec. 6, HX 94, bound for River Mersey with a cargo of gas oil in station 41. A report on the passage is also available for this convoy. With Evita and Inger Lise, she's now listed in Convoy OB 277, which originated in Liverpool on Jan. 22-1941 and dispersed Jan. 27 (28? ), Haakon Hauan arriving Aruba on Febr. 14, proceeding to Bermuda the next day. She was scheduled for Convoy HX 112 from Halifax to the U.K. on March 1, but did not sail (Beduin and Ferm were sunk). Going back to Page 1, we see that she was, in fact, still in Bermuda at that time; according to Arnold Hague, she had arrived there with engine defects. She was also cancelled from HX 113 and HX 114 (Hidlefjord was sunk and Kaia Knudsen damaged), but finally joined HX 116 on March 21. Her destination is given as Avonmouth, and she arrived there on Apr. 11, according to A. Hague. Later that month, she appears, together with Inger Lise, Sandar and Victo, in Convoy OB 313, which originated in Liverpool on Apr. 22 and dispersed on the 28th, Haakon Hauan arriving New York on May 8. She was later scheduled for Convoy HX 134 from Halifax on June 20, but did not sail; A. Hague says she had again suffered engine problems. She was also cancelled from the next convoy, HX 135, but is listed as sailing in Convoy HX 141, departing Halifax on July 27. In Sept.-1941, we find her in station 33 of the westbound North Atlantic Convoy ON 14, bound New York, where she arrived Sept. 24, the convoy having been dispersed on the 14th (15th?) - the Commodore's narrative is also available. See also Page 2. Haakon Hauan headed back to the U.K. on Oct. 5 with Convoy HX 153, later joining the westbound Convoy ON 34, which originated in Liverpool on Nov. 7 (Acanthus is named among the escorts). The convoy was forced to heave to in a gale on Nov. 9, and when it was reformed, Haakon Hauan and several other ships were missing (see the Commodore's notes for ON 34), but she arrived New York safely on Nov. 24. Before that year was over, she made one more Trans-Atlantic voyage, having joined Convoy HX 163 from Halifax on Dec. 3. She went back across the ocean with the westbound Convoy ON 54* in Jan.-1942, bound for Baytown, with arrival Febr. 1 (convoy originated in Liverpool Jan. 6, dispersed Jan 17), then headed back to the U.K. later that month with Convoy HX 176 from Halifax. The following month, she's listed in the westbound Convoy ON 77*, which left Liverpool on March 17 and dispersed March 28, Haakon Hauan arriving Halifax the next day. On Apr. 2, we find her in Convoy HX 183 from Halifax, returning on Apr. 23 with Convoy ON 89*, arriving New York on May 7, having been detached from the convoy 2 days before. Her subsequent voyages are shown in the above Voyage Record, as well as on Page 3. On May 25, she was on a voyage in ballast from Norfolk to Galveston when she was torpedoed and damaged by U-753 (von Mannstein), 28 45N 90 03W (off the Mississippi inlet). She was taken to New Orleans, later towed to Mobile where she stayed for over 2 months for repairs. She did not leave Mobile again until Sept. 11 and, having made some voyages around the U.S., she joined Convoy HX 210 from New York on Oct. 1-1942, for which Montevideo served as Commodore Ship. Haakon Hauan, with a cargo of gasoline, had station 42 and arrived Belfast Lough on Oct. 15. She turned around very quickly and joined the westbound Convoy ON 140* a few days later, but had to return to port with weather damage, and subsequently joined ON 143* on Nov. 2, arriving New York Nov. 17. She was scheduled to go back to the U.K. with Convoy HX 220 on Dec. 21, but instead joined the next convoy on Dec. 29, HX 221, cargo of aviation fuel for Stanlow, station 63, arriving Stanlow Jan. 14/15. Abraham Lincoln acted as the Commodore Ship - see also the Commodore's narrative. 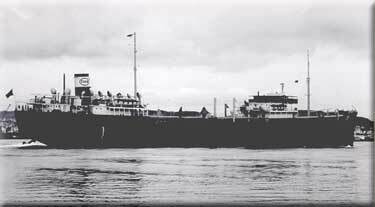 For info, U-753 was also responsible for the attack on Hamlet a couple of days later. See also N.T. Nielsen Alonso. For her return voyage to the U.S. she joined Convoy ON 162 on Jan. 23-1943, arriving New York on Febr. 10, according to Page 3. About a week later, A. Hague has included her in Convoy HX 227*, departing New York on Febr. 18. Acanthus and Eglantine are named among the escorts (see HX Convoy escorts). 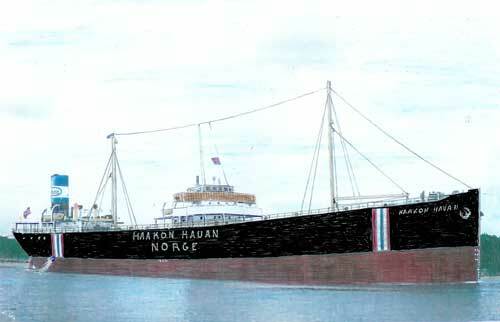 Haakon Hauan arrived Barrow on March 6, and subsequently returned to New York in Convoy ON 173*, originating in Liverpool on March 13, arriving Halifax March 29; Haakon Hauan arrived New York March 31. She now headed to North Africa the following month. Again, see Page 3 of the archive documents as well as Hague's Voyage Record. That summer, on June 17-1943, she shows up in the Bizerta portion of Convoy MKS 15 - scroll down to the second table on my page for that convoy. No voyage information is given, but she subsequently went back to the U.S., arriving Baltimore from Gibraltar on July 11 (see Page 4), and on Aug. 7, she sailed from New York in Convoy HX 251, destination Bowling, station 35. Laurits Swenson served as Commodore Vessel, and Acanthus is again named among the escorts, as are Potentilla nad Rose. Haakon Hauan arrived Bowling on Aug. 23, later proceeding to Clyde, and from there, she joined the westbound Convoy ON 199*, but returned to port (Belfast Lough), later joining ON 200*, and arrived New York on Sept. 18, having sailed from Belfast Lough on Sept. 3. Already on Sept. 22, she can be found among the ships in Convoy HX 258* from New York, arriving Liverpool Oct. 6, then at the end of that month, she's listed in the westbound Convoy ON 209*, arriving New York Nov. 17 (Commodore in Laurits Swenson). She now headed to North Africa again, and at the end of that year she made a voyage from Gibraltar to Oran with Convoy KMS 35*, arriving Oran on Dec. 23, subsequently returning to the U.S. from there in Jan.-1944. On Jan. 28-1944, she's listed in Convoy HX 277 from New York, bound for Clyde, returning to New York with Convoy ON 225*, which originated in Liverpool on Febr. 22 and arrived New York March 8 (Commodore in Abraham Lincoln). On March 13, we find her in Convoy HX 283, and the following month, she was one of several Norwegian ships in the westbound Convoy ON 231*, namely Bernhard, Østhav, Ferncourt, Spinanger, Vav, Solstad, Idefjord, President de Vogue, Heranger, Kong Haakon VII, Thorsholm, Skaraas, Høyanger and Nordanger, some of which had also been in HX 283. ON 231 left Liverpool on Apr. 7 and arrived New York on the 24th. From the U.S., Haakon Hauan proceeded to the Mediterranean; again, see Page 4 and the above record. In June-1944, I have her in Convoy GUS 44 which originated in Port Said on June 24. This convoy was bound for Hampton Roads (arrival July 18), but several ships parted company, while others joined along the way (some Norwegian). In fact, Haakon Hauan joined from Bizerta on June 30, and was only bound for Casablanca on that occasion, but from there, she proceeded to the U.S. in Convoy GUS 45 and arrived Philadelphia on July 29. Already on Aug. 4, she appears among the ships in Convoy HX 302 from New York, destination is given as Belfast and Heysham. She subsequently returned with Convoy ON 250*, which originated in Liverpool on Aug. 24 and arrived New York Sept. 7 (Commodore in Samuel Bakke) - see also Page 5. No more Trans-Atlantic voyages were made until Apr. 13-1945, when she's listed in Convoy HX 350* from New York, and on May 6, she can be found in the westbound Convoy ON 301* (Commodore in Høyanger). Her destination is given as Curacao, but when going back to Page 5 above, we see that she proceeded to the U.S.; Curacao is not mentioned at all for this period. Page 6 shows her voyages to March-1946. * All the ON convoys mentioned here had several Norwegian ships. They will be added to individual pages in my Convoys section in due course, along with further details on each. In the meantime, the ships sailing in them (and escorts) are named in the section listing ships in all ON convoys. The entire HX series will also be updated and completed, but for now, please see ships in all HX convoys. As will be seen, they also had several Norwegian ships. KMS 35 will also be added, see ships in all KMS convoys. For more information on all the Norwegian ships named on this page, please see the alphabet index below, or go to the Master Ship Index. Owners later renamed A/S Norske Esso, Oslo. Sold in Jan.-1960 to British Iron & Steel Corporation and allocated to Thomas W. Ward Ltd. for breaking up. Arrived Inverkeithing, Scotland on March 6-1960, to be broken up. Back to Haakon Hauan on the "Ships starting with H" page. The text on this page was compiled with the help of: "Nortraships flåte", J. R. Hegland, E-mail from R. W. Jordan, "The Allied Convoy System", Arnold Hague and misc. (ref. My sources).